While it lacks the popularity of Seoul among travellers, the brazen port city of Busan sweats with enough swagger to drop in as a must-see destination for any first-time visitor to Korea. Many of the most obvious charms of Korea’s second biggest city don’t appear instantly. Carve out just one day in Busan though and the picture will slowly start to focus. Sift through the best things to do in Busan, and you’ll dazzle at mountainside and seaside temples, splash around on some of the best beaches in Korea, and embark on a shopping spree that’d make the likes of Myeongdong or Ginza proud. There’s no better place to give your Busan trip an adrenaline shot than at the city’s most compelling site, Haedong Yonggungsa Temple. This ancient Buddhist temple, digging its roots as far back as the 14th century, sits perched along the oceanfront giving it a unique maritime vibe that slots it in among the best temples in Korea. The approach to the heady temple complex begins on a 108-step staircase, lined by atmospheric stone lanterns. As you descend towards the shoreline, Haedong Yonggungsa Temple comes into view, slowly revealing its glory one step at a time. 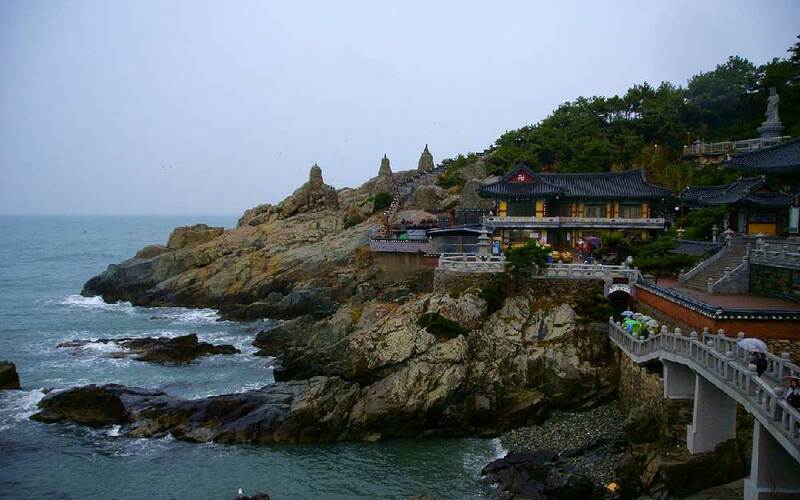 As you’d imagine, visiting Haedong Yonggungsa Temple is one of the most popular adventures for travellers to Busan. Once you arrive, it’s best to simply experience the temple at leisure. Explore its nooks and crannies, from the colourful Daeungjeon Main Sanctuary and gilded Buddha statues to the stone pagodas, stupas, and cave sanctum. To get the most out of your visit, drop into the temple complex as early as possible. Haedong Yonggungsa Temple opens to visitors at 5am. This is the perfect time to visit as the morning sun bathes the temple complex in its soft orange hues, creating a scene that’s nothing short of glorious. Undoubtedly, this is one of the best sunrises you’ll ever catch, not just in Busan or Korea, but anywhere! Getting to Haedong Yonggungsa Temple: It’s a bit of a trek out to the temple complex. First, hop onto the Busan subway and make your way to Haeundae Station (Line 2). At Exit 7, transfer to Bus 181. The Yonggungsa Temple Bus Stop is about 12 minutes away. From here, it’s another 15 minutes by foot to the temple. 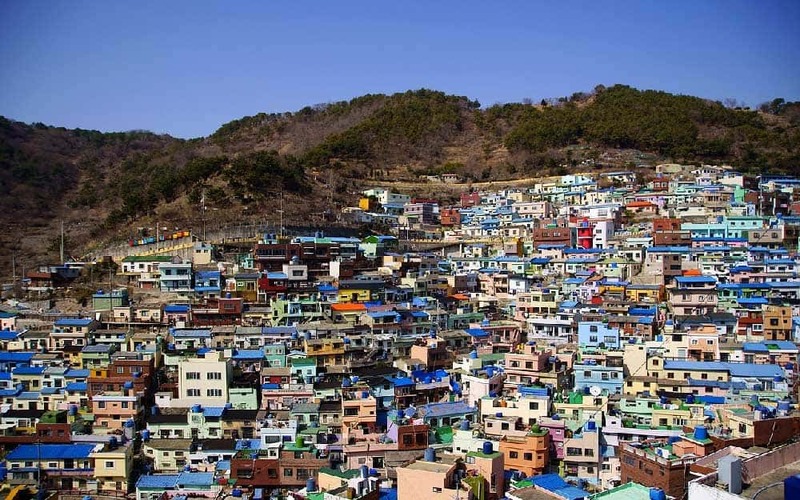 If you’ve seen postcards of Busan, there’s no escaping the famous hillside charms of Gamcheon Culture Village. Once little more than a shanty town on the fringes of the city centre, this small “village,” now a full-on part of Busan, is one of the most interesting corners of Korea’s second metropolis. At a glance, Busan can feel like a collection of faceless and styleless buildings stretching as far as the eye can see. Gamcheon Culture Village completely defies that reputation by painting the city with much needed surface colour among its vividly toned buildings. And things get even more compelling at street-level. Wander into Gamcheon Cuture Village, plying up and down its steep alleys, and you’ll uncover a whole slew of bright wall murals, art galleries, small craft stores, and cafés. Don’t take it too fast; this is one area of Busan you won’t want to rush. Getting to Gamcheon Culture Village: Take Busan subway Line 1 to Toseong Station. From Exit 6, locate the bus stop for Bus Sakha 1-1, Seogu 2 or Seogu 2-2. Any one of these will take you to Gamcheon Elementary School Bus Stop, where you’ll be able to continue your journey through the village by foot. Whether the thought of staring face-to-face with odd sea creatures (and perhaps eating one) appeals to you or not, you probably shouldn’t miss out on the experience of visiting Jagalchi Market when travelling to Busan. This bustling market is like none other; it’s chock-loaded with the freshest seafood in the country with a long history and cultural buzz that makes it one of the top places to visit in Korea. In the clamorous market stalls of Jagalchi Market, everything from octopus and squid to sea urchin and eel hangs about. Adventure eaters should take the opportunity to test their constitution at one of the hoe (raw fish) restaurants dwelling on the second floor. Some Jagalchi Market restaurants will even prepare your purchase from the market area for you on the spot for an unforgettable meal as fresh as they come! Getting to Jagalchi Market: Take the Busan subway Line 1 to Jagalchi Station. The market lies just 5 minutes by foot from Exit 10. Even if you’re on a time-crunch, there’s no excuse for missing out on Haeundae Beach, Busan’s most famous attraction. Draped over about a kilometre and a half of coastline, Haeundae Beach captures the heart of nearly every Busanite. With all its energy and its gorgeous ocean and city views, it’s the perfect place to spend an afternoon getting to know the city. Even if you’re not keen on taking a dip in the ocean, Haeundae Beach’s charms don’t end with its oceanfront prowess. Along the beach’s boardwalk, you can treat your tastebuds to some of the best restaurants in Busan or simply grab a pint of maekju (beer) and let the sea entrance you. On warm sunny days, Haeundae Beach also becomes abuzz with artists and performers trying their best to cheer up the beachgoers. Getting to Haeundae Beach: From Haeundae Station on the Busan metro (Line 2), use Exit 5. At street-level, it’s about a 8- to 10-minute walk to the beach and boardwalk along Gunam-ro. Quite possibly the grandest site in Busan, Beomeosa Temple is an absolute must-see while visiting the city. 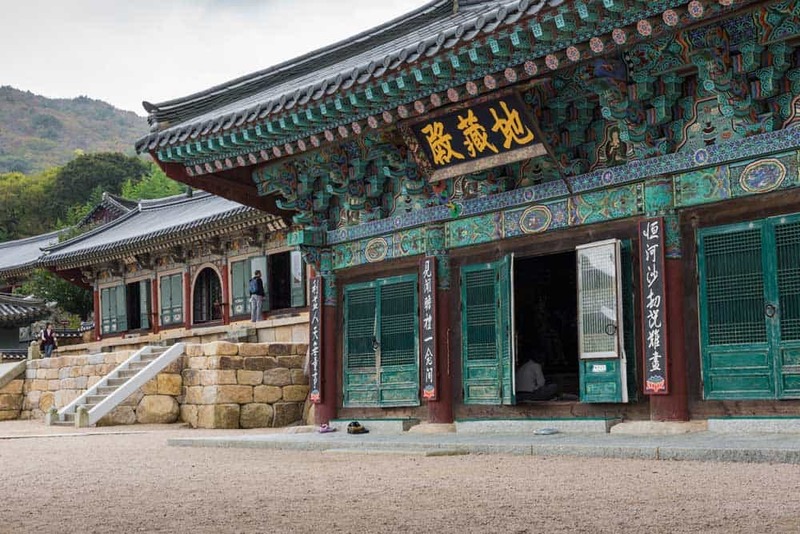 Drawing upon a 1,300-year history, this Buddhist temple grew in importance over the centuries to become one of the most important places of worship in Korea. The current reincarnation of Beomeosa Temple dates back to 1613 when it was rebuilt after the bloody Japanese invasions during the Imjin War. Most impressive is the main Daeungjeon Hall, long considered one of the finest architectural specimens of the Joseon Era. Also worth keeping an eye out for is the ornate 9th-century Iljumun Gate and the colourful tree-fringed Cheonwangmun Gate. What makes Beomeosa Temple one of the most compelling places to visit in Busan though is its location. Built upon the fringes Geumjeongsan, Busan’s most famous mountain, Beomeosa Temple blends seamlessly among the evergreens and maples. To see the temple at its best, visit in late spring when the delicate purples of wisteria flood the area or in fall when the autumn colours overtake the mountain’s trees. Getting to Beomeosa Temple: Take Busan subway Line 1 to Beomeosa Station. From Exit 5 or 7, walk up Chongnyongyejeon-ro about 5 minutes to the Samsin Bus Stop, just before the traffic circle. Hop onto Bus 90 and exit at the stop in front of the Beomeosa Ticket Office. Those who are more inclined to consumer goods and regular street food will prefer a visit to Gukje Market over the take-it-or-leave it port-side “charms” of Jagalchi. This market, also referred to as Nampodong International Market, sells just about everything under the sun from clothing and household goods to electronics and mouth-watering Korean street food. 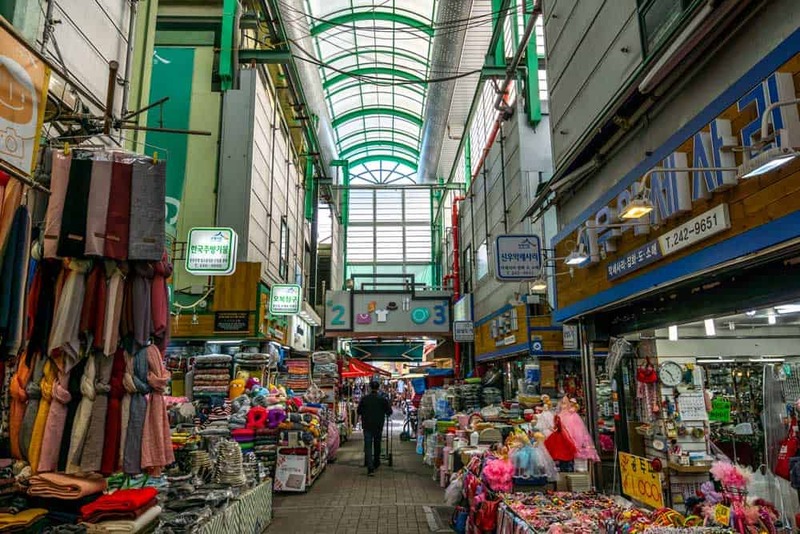 The history of Gukje Market dates back to the Korean War when local refugees, escaping the worst of the fighting, peddled international goods disembarking at Busan’s port (currently the 9th largest in the world). Today, the market’s grown to the biggest in the city, practically swallowing up other once separate markets like Bupyeong (Kkangtong) Market. As fun as it is to ply through everything under the sun, the best way to experience Gukje Market is through the tastebuds. Grab yourself a meal among the crowded stalls of Restaurant Alley (Arirang Street) in the central part of the market to take down Korean specialties like chungmu gimbap (squid & radish seaweed rice rolls), bibim dangmyeon (spicy glass noodles with fish cakes), sundae (Korean blood sausage) or, for the sweettooths in the house, ssiat hotteok (seed- and sugar-filled sweet Korean pancakes). Getting to Gukje Market: From Jagalchi Station (Line 1), take Exit 7. Swing left at the first intersection onto Junggu-ro while crossing to the opposite side. Walk straight for three and a half blocks and you’ll see the market streets to your right. There’s hardly a more iconic image of Busan than peering upon the skyline with the lights of Gwangandaegyo (Gwangan Bridge) shining on. 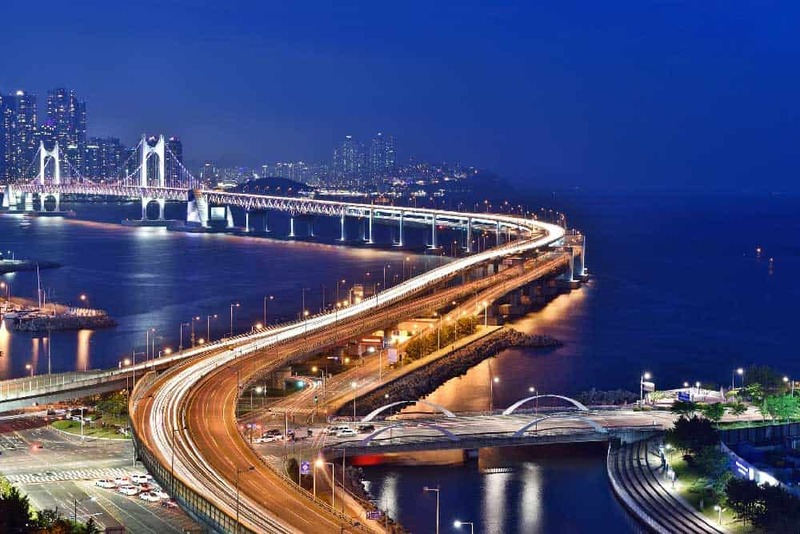 This massive bridge, spanning over seven kilometres between Namcheon and Centum City, is one of the most awe-inspiring structures in the country and an integral part of the city’s guise. Other than contemplating its mind-boggling size and admiring the views, there isn’t necessarily anything to do at Gwangandaegyo Bridge. To get the most of it, drop down to Gwangalli Beach, the city’s second most popular oceanside recreation spot. Pick your perfect viewing spot from the multitude of seaside restaurants, cafés, and bars, and watch as the incredible Busan evening cityscape surfaces before your eyes. Getting to Gwangandaegyo Bridge: To get to Gwangalli Beach where the best views of Gwangandaegyo arise, zip over to Gwangan Station on Line 2 of the Busan metro. From either Exit 3 or Exit 5, it’s about a 10-minute walk down Gwangan-ro to the seafront. Despite a name that’s a little more formidable than its looks, Yongdusan Park and its namesake Yongdusan (Dragon Mountain) make for a pleasant afternoon out in the city. Set among beautiful evergreens, this park in central Busan throws down some satisfying vistas over the city and the port. To extend the views at Yongdusan, on its own rising just 49 metres above sea level, scuttle up the park’s centrepiece Busan Tower. For just W8,000 ($7.41), you’ll get to scope out 360-degree views of the city from 120 metres higher than the mountain itself. Getting to Yongdusan Park: From Nampo Station (Line 1), take Exit 3 and walk straight up Nampo-gil one block. At Gudeok-ro 22-beon-gil, hang a right. Walking straight ahead, you’ll see the escalators to Yongdusan Park on the opposite side of Gwangan-ro. Try to pick out where to stay in Busan is rarely easy for first-timers. Like Seoul, Busan is a massive sprawling city. What makes it even more difficult is that the best tourist attractions in Busan are spread far and wide—with mountains and the sea working in tandem to break neighbourhoods apart! 24 Guesthouse Nampo Station: A cheery budget hostel/hotel that features both shared and private accommodations in an awesome location in Nampo. The wonderful rooftop terrace with sweet city views is a nice bonus. Arban Hotel: A fantastic 3-star hotel located in the bustling neighbourhood of Seomyeon. Rooms are large and well-appointed but the real star here in the calming rooftop garden terrace featuring excellent views of Busanjin. Park Hyatt Busan: Easily the best luxury hotel in the city. Located next to the marina in Haeundae, this delectable 5-star serves up spectacular sea & skyline views, including the iconic Gwangandaegyo Bridge, from its top-notch rooms and fine on-site restaurants. Got time for some sun worship? 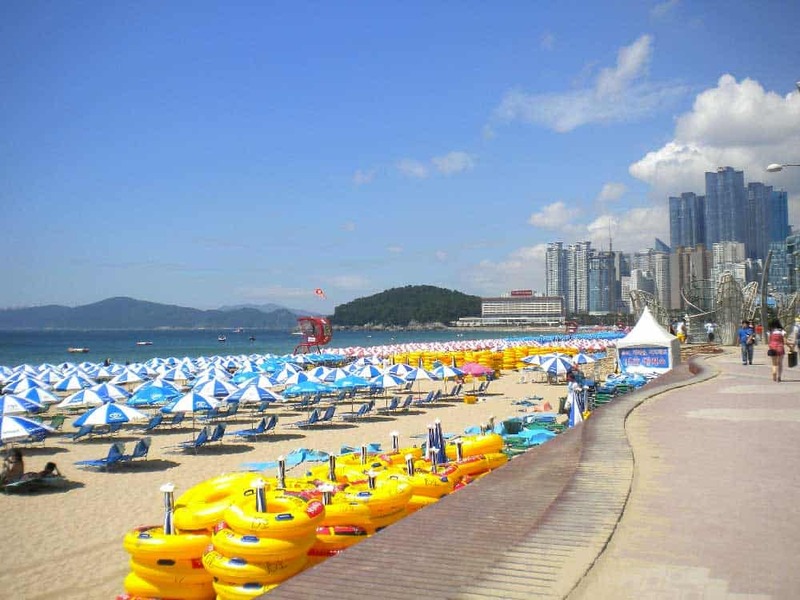 Get out your sunscreen and jam over to Haeundae Beach to enjoy the city’s favourite seafront space. Craving the perfect sunrise? Gear yourself up for an early morning visit to Haedong Yonggungsa Temple on the fringes of the city to experience one of the most dramatic sunrises of your life. Want to add a little colour to your Busan trip? Vivid murals and quaint art galleries await in the ambient mountainside Gamcheon Culture Village, a short trip from Busan’s city centre that feels worlds away from its cosmopolitan bustle.